- One Kid's pool (333 m2; depth – 40 sm) with a Pirate ship that includes four slides, two water guns, water mushroom, six water rings and a dolphin shower. 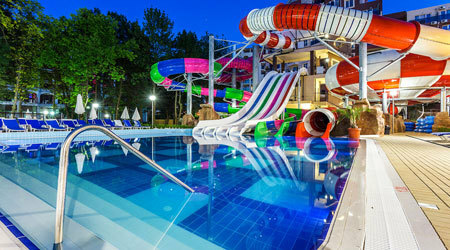 - Main pool for adults, ideal for swimming, water sports and gymnastics (200m2, depth – 1.20-1.50 m). The use of water park is included with the All inclusive price and the new water attractions are available exclusively and only for hotel guests. No outside visitors are allowed unfortunately. The 4* Hotel Laguna Park has also expanded the "Relax" pool area by offering guests in addition to the existing outdoor pool for adults with a kids corner, one new attraction kids pool with an 3 slide Octopus for the little guests. You can book the 4* Hotel Laguna Park this summer or for summer 2017 now with Balkan Holidays from just £417pp.